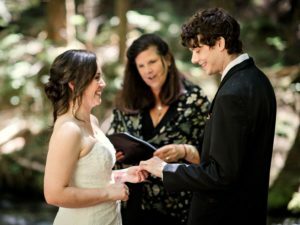 From Our Hearts: Susie creates the perfect meaningful and unique ceremony for every couple. She is an incredible storyteller and will make your love the star of the show. How They Stand Out: Every couple has a love story just waiting to be told! As a writer and storyteller at heart, I create a beautiful, original narrative of each couple’s Love Story to be included within the wedding ceremony. 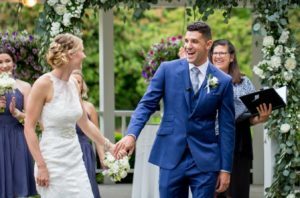 I work closely with each couple and together we craft a meaningful, memorable, and deeply personal wedding ceremony created exclusively for them. My promise is to create the perfect ceremony with impeccable service and have fun along the way! Being the Officiant at a wedding is not merely a job. It is truly a privilege I take to heart. Piece of Advice: I am not only a Celebrant and wedding professional, but also someone who got married a little over three years ago. I truly understand the excitement and ALL that is involved in planning a wedding and those endless lists! My best advice? Take some deep breaths and enjoy the journey! Choose your vendors wisely. Get to know them and more importantly, make sure they take the time to get to know you! It doesn’t matter the size of the wedding; the experience and personal service should be just the same. 10% discount on all wedding ceremonies I create and officiate at Water Oasis.